So, I’m “back” in the UK after a couple of weeks the other side of the pond. The more often I do this, the more I realize how totally I don’t feel I belong in this country – the UK’s a nice place to visit, but I’m done with living here. For me, the only issue is whether I ultimately settle in the US or in Canada. The former is preferable for high tech jobs, but the latter is politically and socially more conducive to my way of thinking. This is important, especially when you just decided that being an atheist isn’t nearly as cool as being a member of the Church of the Flying Spaghetti Monster – pirates rule! So I ordered a copy of the Gospel of the Church of the Flying Spaghetti Monster and am incidentally also waiting for permission to make “Linux is evolution, not intelligent design” t-shirts. As soon as I get approval, I’ll stick some up on cafe press. Canada was fantastic. Did I mention that it’s one of the greatest countries in the world? I think I did, just a few times. In fact, I’m going to do another weekend trip sometime soon since I think October/November is just a little too far away to be over in North America again. I hung out in Montreal and Ottawa for most of the time around and during OLS. I saw a bunch of talks, hosted a BOF on drivers, had a lot of ideas, talked to really cool people, consumed 12 shots of coffee in a day, had 6 whiskeys and 10 shots on another day, generally didn’t sleep much for a week, and realized that OLS is just getting cooler as the years pass. Sure the programme could do with more work next year – but who can honestly say that’s the only reason for turning up? Noise cancellation headphones rock. I picked up a pair at Logan the other night (right after having a double extra order of Clam Chowder at Legal Sea Foods – the folks there were totally understanding of my need to stock up before my return to the land of the quaint and boring) from a store where the dude who sold me this impulsive buy recognized the iPod Linux bootloader on my iPod – turns out Mad Dog goes there quite often too. Funny. Anyway, I’m now able to turn off the annoying world around me, thanks to the power of a little signal processing and basic audio theory applied to a gadget that should have been installed in every Jet Liner about a billion years ago anyway. Did I mention that Canada rocks? So I made it to the United States and am hanging out in Boston/Westford for a couple of days prior to OLS. I was staying close to downtown Cambridge yesterday, but today I’m out in the woods due to the logistical benefit and my lack of driving/car ownership. I’m enjoying my trip so far insomuch as I expected to be busy but also have time to reflect upon the whole relocation thing. And in summary, I expect that my life will become even more hectic, but that I’m going to enjoy it in the longer term (remind me I said that in a year from now), though I do need to find a place that’s near Cambridge if I’m going to avoid 6am introspective blogging such as this. I arrived on Wednesday afternoon and got to my hotel with just enough time to remove plane-smell before going out for the evening. The flight in from IAD was interesting in a “on time departure”, “sitting on the runway for 40 minutes” let’s-all-play-with-statistics kind of way. Anyway, a bumpy ride followed by traffic, trains and a cab soon put that behind me. A half bottle of wine, a few pints and some interesting live music later, and I was feeling much better. I woke up the next day with no real side effects and having had some of the best sleep in a long time. In fact, I should probably tire myself out like that more often. I’m now almost running properly on EST and it’s only been one full day so far. Now I’m looking forward to next week when I’ll probably have virtually no sleep during the entirity of OLS. In other news, I’ve decided it’s a recurring theme that I always go after the unobtainable. It’s a curse. And anyway, there’s just something about having your beating heart ripped from your chest that makes that worthwhile. I’m quite certain that somebody somewhere would have a whole heck of a lot of psychobabble to describe these situations I get myself into. Anyway, the lesson to be learned here is you can be as smart as you like and yet still understand nothing about the needs of other real-life human beings. I’m adding “distance” and “youthful optimism” to my list of things that piss me off about myself, the world, and everything. I’m now the official maintainer of module-init-tools and am looking to get more folks involved with future development. There’s a mailing list, there’s a wiki, there’s a lot of interest in getting various patches moving forward. One of my first key interests is in adding configuration file support to tools like depmod so we can dynamically alter the priority of “extra”, “updates”, “weak-updates” and other directories under /lib without having to have lots of per-distro patchsets in place. We also need to get some of the non-intrusive vendor patches upstream and generally have a code cleanup (there are a few obvious memory leaks from just looking at the list handling code in depmod alone). Further out, there’s an interest in allowing greater integration with udev and expanding the functionality of modinfo. If you have useful ideas, please check out that website and mail me suggestions. If you have a kernel project that you’d like to host on kerneltools.org, please also drop me an email – the wiki is easy enough for you to just add projects anyway. I am not now, nor have I ever been “anti-American” nor necessarily “pro-American” in the way that people would like to think I might be. I have believed for a long time that the US has a very flawed foreign policy, that the Republican party is extremely damaging to the country as a whole, that modern day isolationism doesn’t work and that Canada’s previous Liberal government made a number of much more enlightened decisions than their neighbor (which I expect Harper’s Conservative government to screw up as quickly as possible). I am, however, very much pro the reasons for the founding of the United States and the ideology underpinning the whole thing, I just feel that there are a few bad apples trying to ruin it. But the same is true of most western[ized] countries. Actually, I’ve been remarkably consistent in my geopolitical views for a long long time (there’s more than one reason for the blue theme on this blog…), it’s just that interpretation will inevitably follow whatever I choose to talk about. If I decide to write about how I think Independence was a good idea then I’ll be accused of being “pro-American” by some people. But if I decide to criticize the Iraq war as an unjustified conflict retrospectively relabled as a liberation excise to calm those with short memories (as I have done many times), then the inverse will be deemed true too by some people. Most people have a mixture of views on different subjects, not always in line with one overall viewpoint or another. Photo: My alter ego, Team America Jon comes to save the day. So, just in time for Independence Day to be over, my order for large US flags was fulfilled and I became the proud owner of one too many of them. 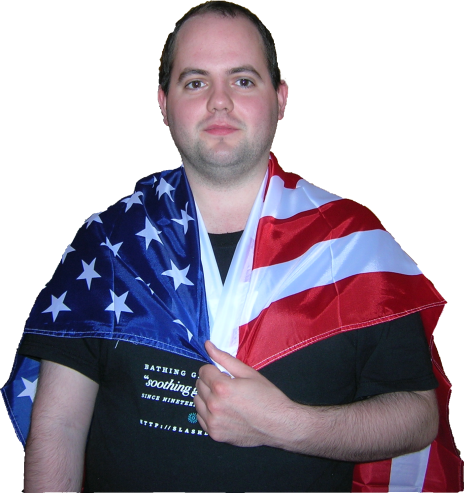 I’ve now got 4 5×3 feet flags, one 3×2 and a giant cotton flag on order that I’ll pick up in the US next week. That’s not counting the original Star Spangled Banner t-shirt I ordered on cafepress over the weekend. Betsy Ross would be proud (and a little disturbed, I’ll reckon). There’s no particularly good reason for this, it just seemed like a good idea at the time. I don’t like to do such things in half measures. “But when a long train of abuses and usurpations, pursuing invariably the same Object evinces a design to reduce them under absolute Despotism, it is their right, it is their duty, to throw off such Government, and to provide new Guards for their future security” — Declaration of Independence (backdated July 4th 1776). Anyway, 230 years ago on Tuesday, 56 brave people signed a declaration that changed the world forever. In case you’re interested, five of them were later caught and died (read: brutally and horribly murdered for treason) at the hands of the British (it’s arguable whether they died specifically for signing it or just because the British didn’t think too kindly of them in a cup-of-tea? let’s all go to war fashion). These weren’t poor men either – amongst them were lawyers, farmers and other men of notable means. They knew their lives would never be the same, but they believed in something. In fact, they believed that they were morally obligated to effect positive change on the world around them because they were in a position to do so. And I think that’s amazing. 1776 was hardly the finest hour for the British and what’s most annoying to me is that we don’t learn in school about that history. In fact, few people in the UK can be aware of the true extent to which we were utterly evil and reprehensible in our actions (we burned the library of Congress in the War of 1812 too – so the British did know in history how to burn books). For if they did, it might get a little more attention in the media next 4th July. It’s not just an American holiday, it’s a reminder that we in the United Kingdom weren’t always whiter than white either. Learning about the history of the United States (trivia: did you know Texas was an independent nation for only 9 years?) makes me think differently about events that came later – for example the American aid in WWII that helped us out of a real jam. I now understand the isolationist viewpoint of the US in earlier times, though I’m glad the world of today is very much a more connected one. My point? For all the Republican right-wing crap of the modern day United States of America, it’s a great nation that’s done a lot of good in the world too. In the future, I have no doubt that the United States will address a few of the efforts to undermine democracy in the modern age. Illegal spying and other government interference in due process that goes against all that the Founding Fathers believed in. That declaration of Independence was made 230 years ago this week, I think it’ll still be good in another 230 years – and no, neither this nor the constitution is “just a piece of paper”. No matter how hard Bush and elements of the Republican party try to destroy the values of these historical documents, they’ll still be there. Update: I just ordered a copy of Common Sense and Rights of Man by Thomas Paine from Amazon. Common Sense is one of the books that kickstarted the American Revolutionary War and describes Britain in no uncertain terms for how it treated its North American colonies in the 18th century. Paine described the “royal brute of Britain” using language that appeals to me. And yes, I’m anti-unelected unrepresentational Monarchy. I think that’s pretty obvious. Monarchy is antiquated crap. I guess I need to learn a lesson in tolerance from time to time. Even though I disagree with the right wing media and most of the things that they stand for, they should have an opportunity to make their point. And not all football is bad – I’m sure for every English football hooligan there are a dozen kids in Africa having harmless fun through football (and yes, I’m sure there are smart football supporters in England – do us a favor, go ask the violent traveling hooligans to stop being a waste of time and energy). BBC Breakfast interviewed two people about lesbian/single women getting IVF and similar treatments. A Liberal Democrat (the party I support) was suggesting that such women should have equal access to treatment, while a right wing sociologist with an agenda repeatedly “informed” us that single parent families work out much worse on average, so they shouldn’t be promoted or furnished with opportunities through new medical treatments. The sociologist really pissed me off – she’d be up right against the wall in my revolution. MPs are apparently calling for the immoral 28 day terror detention limit to be raised. This is the time that the UK can run “gitmo” prisons, holding people for 28 days without due process. Fundamentally, this is possible because the UK has no constitution (and thus is not a free country by definition), so the government can arbitrarily decide to lock people up and throw away the key, without any reasonable possibility for recourse. They wanted 90 day detentions originally, and they’ll probably get them now. After all, Friday is the one year anniversary of “7/7″ and I’m sure that mentioning that a few dozen times will be all that’s needed for the idiot press to get with the programme. I’m not just some left-wing nutjob who is defending the rights of terrorists, I’m defending the rights of the rest of the population, who are often far too dumb to realize what’s going on even when it is too late. I know the UK has been around for a long time, but these days there’s too much MTV and cheap crappy TV to keep people sedated enough to refrain from taking action. This country will, very soon, have a national ID card (I give it a couple of years), start holding people without trial (trial by jury is itself under threat) for 90 days or longer, and generally just continue with the big brother crap until it’s not possible to take a crap without it being recorded, analyzed and processed by some government agency. Anyway, two major annoyances so far today and it’s only 8am. If only regular people would care so much about these things, we’d be living in a better world by 9 o’clock. I’m talking about the kind of people who watched the Live Aid/Live 8 followup programmes for the Madonna and U2 content, not the message that was allegedly being sent through such popsical farce. I still want to do something on the weekend before OLS. Obvious options include visiting New York for the day Saturday or trying to catch a game at Fenway Park, if some tickets magically appear from somewhere. Total cost was just 50GBP more than a direct flight to Ottawa. Never let it be said that the airlines aren’t out to screw you for as much as they can – but at least this way I can get a lot more value out of the trip than I would otherwise. I’ll be in Montreal in time for lunch on the Sunday. Hopefully we’ll then utilize pedal power to get to Ottawa, but I’m prepared to take a train if necessary.